Nick and Patrick Rieth, owners of Reith Brothers, is an Innovation Connector success story. The Rieth Brothers are two young entrepreneurs passionate about telling great stories through digital media. They operate their business out of the Innovation Connector in Muncie, Indiana, creating videos for local businesses and organizations, and producing films for themselves and other artists. Rieth Brothers is a digital media company that combines both brother’s skill sets. Nick is a 2015 graduate of Ball State University and has been doing commercial video work for the past four years. Patrick is a 2017 graduate of Ball State University in Animation, but his skill sets are many. He creates beautiful work not only through 2D and 3D animation, but also in his digital paintings, story boards, and motion graphics. Nick Rieth wondered what he was going to do with his life when he began college at Ball State University. “I liked film and that’s about all I knew,” said Nick. He worked in a startup business with a college buddy who had heard of the Innovation Connector. They visited with SCORE, Service Corps of Retired Executives, that provide free business mentoring services to entrepreneurs. SCORE was located in the Innovation Connector at that time. 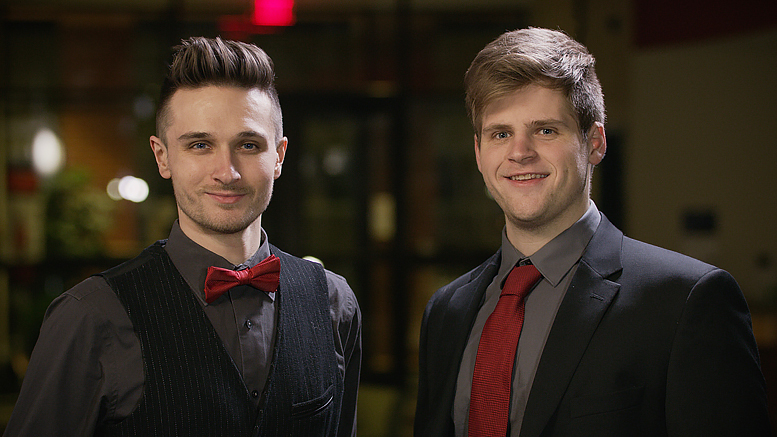 When Patrick started at Ball State University, the two brothers decided they wanted to merge their talents and make creative things together, including feature films. In looking at a variety of paths to take in order to reach their dream career, they chose to start a business and begin creating and filming commercials. That decision led them directly to the Innovation Connector. Not only did the Rieth Brothers get some gigs, they landed a job to create a series of videos for online textbooks for Pearson Educational Resource. Ted Baker landed the contract from Pearson Educational Resource and then contracted the Rieth Brothers to do the filming and editing. The brothers also enjoy talking about the work they have done for the Excellence in Innovation Awards the last two years for the Innovation Connector. In the spring of 2015, and lots of business coaching later, Nick and Patrick bought a company. Ted Baker suggested they move into the Innovation Connector. “The Innovation Connector has been huge for our growth. Ted gave us a ton of vital help and advice that otherwise we would have missed if we had just bought a small office downtown,” said Nick Rieth. “Our dream is to move to the West Coast,” said the Rieth’s. “We have a group of creative people that always work together. Recently, part of the group moved out to Los Angeles and found the beautiful paradox of LA is trying to find a place to live.” The creative group re-grouped and decided that the integrity of the creative team, and staying together, was more important than moving to LA. “We know that LA is the hub of entertainment. We don’t do things arbitrarily. We are taking a little more time in an area that we know, around people and business that we know, to get even better prepared. We are moving to Indianapolis for a year,” said the Rieth’s. “Ted Baker and the resources at the Innovation Connector did more than help us learn how to start a business, he showed us the possibility of a business,” said Patrick Rieth, when asked about memorable lessons learned. Visit www.RiethBrothers.com to view Patrick and Nick’s online portfolio and follow them on their dream job journey.